The antiX homepage says that it is designed to be fast, lightweight and easy to install. 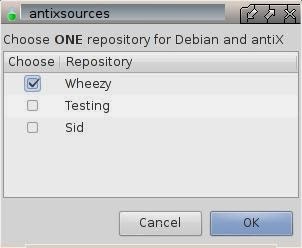 Based on Debian’s testing branch, antiX is truly one of those distributions designed to run on older machines. The homepage states that it will comfortably work on a Pentium PII computer with 64 megabytes of RAM. There are 3 versions of antiX available varying in size from 690 megabytes down to a core version weighing in at just 135 megabytes. Last but not least antiX is available in 32-bit and 64-bit versions. I have spent the past week testing antiX. Unfortunately I don’t have a PII available to really test the credentials. The oldest computer I have is a Samsung R20 with 2 gigabytes of RAM. It is about 6 or 7 years old. 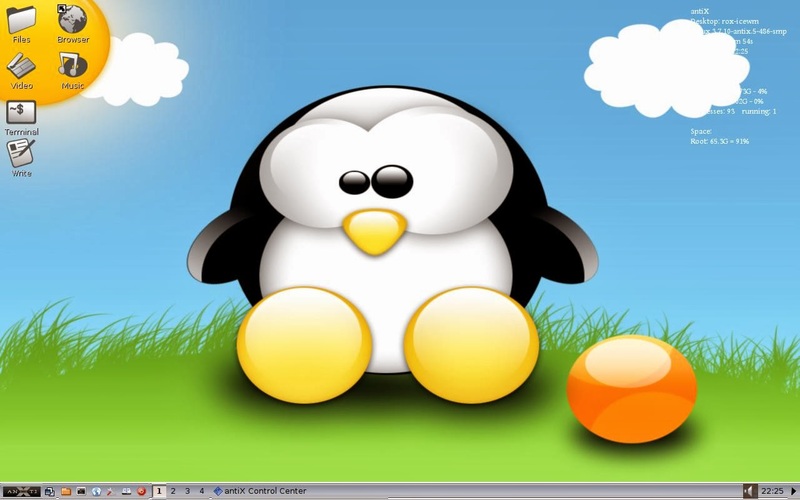 Whilst the test computer struggles with running Ubuntu due to its graphics capabilities it does run most other lightweight Linux operating systems without encountering any problems. You can download antiX from http://antix.mepis.org/index.php?title=Main_Page#Downloads. Once antiX has been downloaded you can burn it to a CD or you can use uNetbootin to install antiX to a USB drive. Click here to buy a DVD or USB drive pre-installed with antiX. 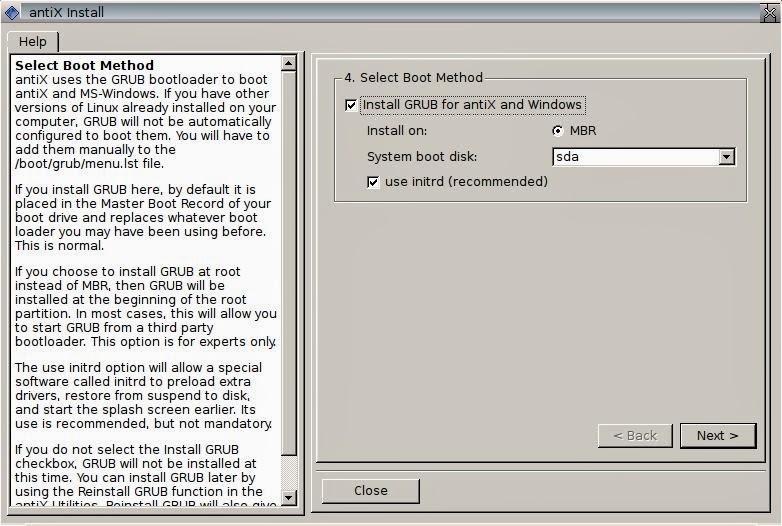 To install antiX boot from the CD or USB drive which contains antiX and when you are in the live environment click on the “Install antiX” icon. Before you install antiX you may wish to try a few things out such as creating a wireless internet connection. When I tried antiX in the live environment I initially had an issue where the wiCD utility (used for setting up wireless connections) couldn’t find my home network. I will explain how I resolved this problem later on in the review. 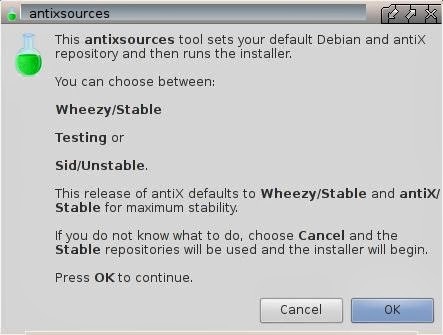 When you first start the installer you are given a choice whether to use the stable, testing or unstable repositories for installing applications. If this is your main computer then I would consider using the stable version or at the very least the testing branch. The first installation screen basically tells you that you are going to be given the choice and the second screen lets you make that choice. The next screen lets you choose how you are going to install antiX. The first box lets you enter the disk to use (i.e. SDA) and then you can choose to partition your drive or if you want to go for the whole disk you can just check the box provided. If you really are installing antiX on an older machine then I find it difficult to believe that you would even consider dual booting. At this point the operating system will be copied to the designated disk. On my laptop it only took a few minutes. After the files have been copied you are presented with the bootloader options. The default options will be adequate for most people. 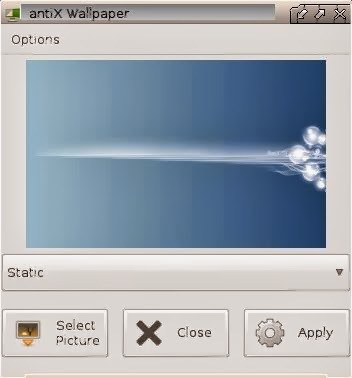 As antiX is designed to run on an older computer the developers have provided a useful screen which lets you choose the services that run when the computer starts up. If you don’t have a printer then there is no point starting the CUPS service. Only a few more steps to go and antiX will be installed. 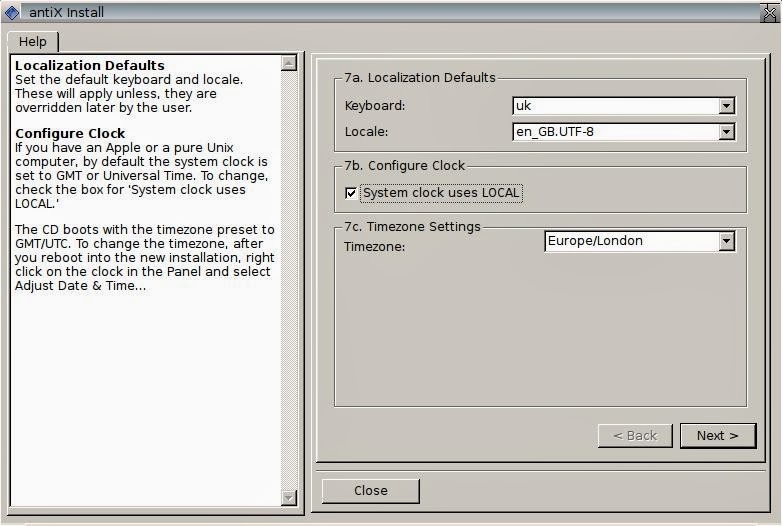 Choose the keyboard, locale and timezone. 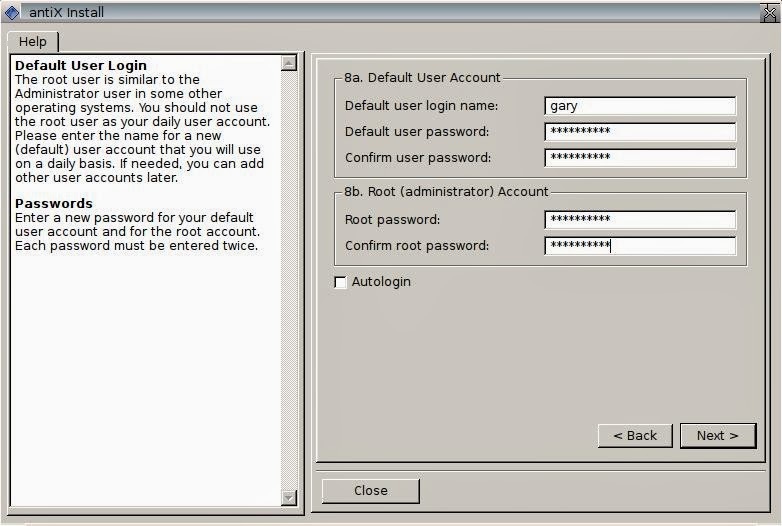 Finally create a user and enter a password and then enter a password for the root user. antiX boots very quickly into the iceWM window manager. Whilst antiX won’t win any awards for beauty it really is very functional and more important than that it is amazingly fast. The desktop features a few icons in the top left corner for accessing the file manager, a text editor, the web browser, video player, audio player and terminal window. The top right corner gives you some information about your system such as the window manager in use, the kernel version, uptime, the date, how much memory is being used, cpu usage and disk space usage. Incidentally on the Samsung R20 running idle the memory usage is just 56 megabytes. Not bad at all. This could be trimmed down by turning off some of the services. The panel at the bottom of the screen has a menu, an icon for showing the desktop, icons for the home folder, terminal, web browser, control centre, USB devices and quit. Also on the panel are icons to represent the 4 virtual desktops. In the bottom right corner of the panel is an audio icon and a clock. There is also an arrow which makes the panel shrink so that it is virtually out of site. (A small arrow sits in the bottom right corner). The antiX Control Centre lets you administer various aspects of your system. There is a series of tabs down the left and when you click on a tab the options on the main pane change. 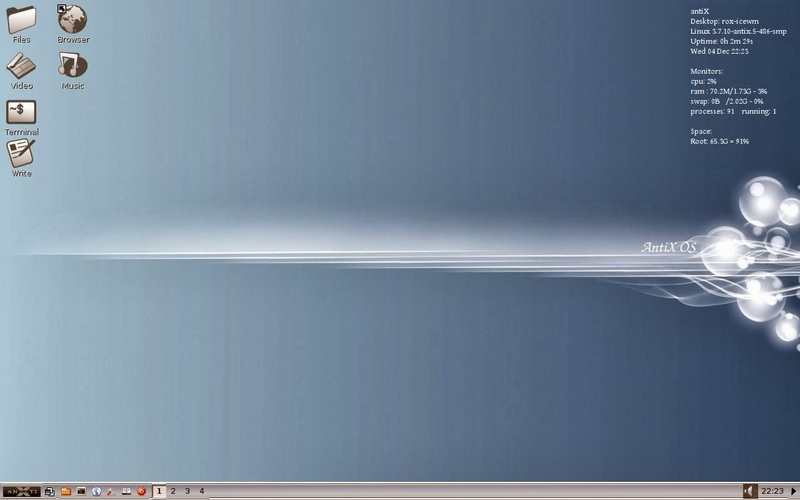 On the “Desktop” pane you can choose to change the wallpaper and change window manager settings. Changing the wallpaper is fairly easy. Simply click the “Choose wallpaper” icon and the following screen will appear. You can choose to have a single static wallpaper or loop through a list of wallpapers. To select the desktop picture to use click “Select Picture”. There are a number of wallpapers to choose from but you can always go online and download one of your own. Click “Apply” to change the wallpaper. The other settings options on the “desktop” pane open a text editor with the configuration file loaded. The “System” tab has options for managing packages, configuring the system, choosing the startup services, managing users, editing config files and setting the date and time. 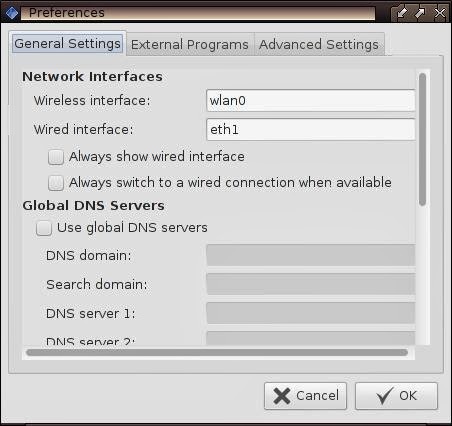 The “Network” tab provides methods for connecting to wired and wireless networks which I will come onto shortly. The “Session” tab lets you choose your screen resolution, keyboard layout and login options. 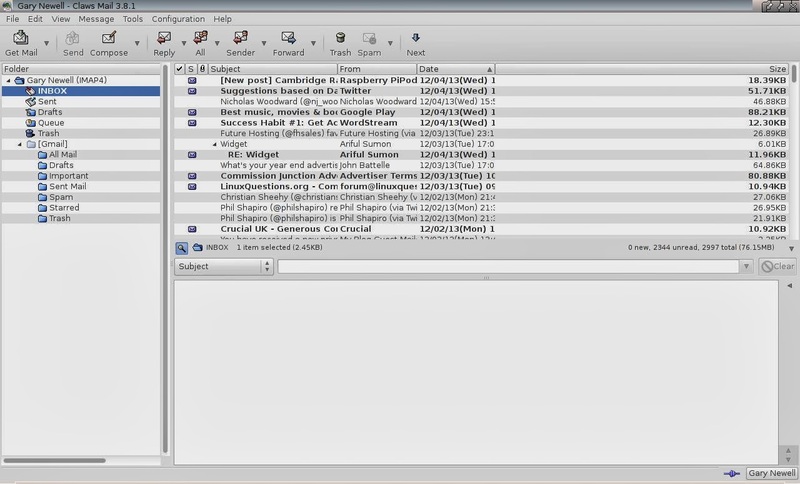 The “Live” tab provides a method for remastering antiX and for setting up persistence. The “Disks” tab has options for partitioning a drive, creating an antiX USB drive, backing up your system and synchronising directories. Finally the “Hardware” tab lets you see system information, lets you set up printers and enables you to adjust the audio settings. To connect to the internet open up the Control Centre and navigate to the “Network” tab. There are a couple of methods available for connecting to a wireless network but I recommend using wiCD. When I first used wiCD no networks could be found. To fix this problem I had to click the arrow in the top right corner and select “Preferences”. On the “General Settings” tab I had to enter wlan0 and then click the “OK” button. When I clicked “Refresh” on the main wiCD screen my networks suddenly appeared. All I had to do then was click “Properties” next to the relevant network and enter the security key. Clicking “Connect” then connected me to the required network. antiX has a really good selection of applications available. 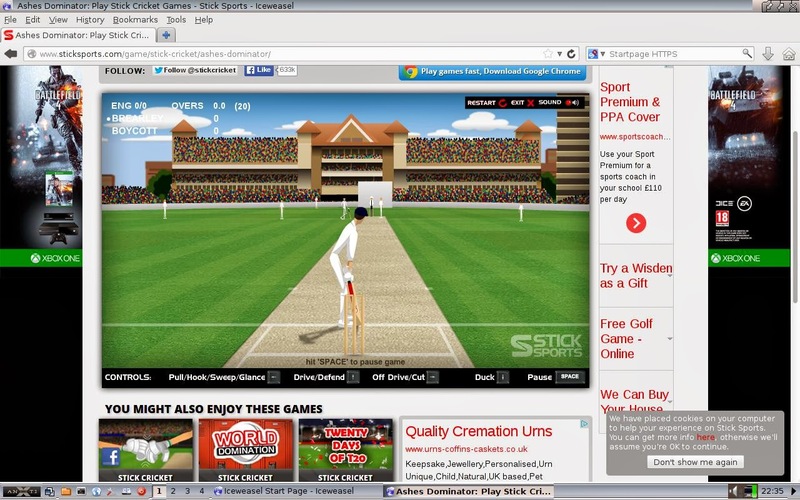 IceWeasel is a decent web browser and is a great solution for a lightweight operating system. get it set up you can use it to view your webmail such as GMail. 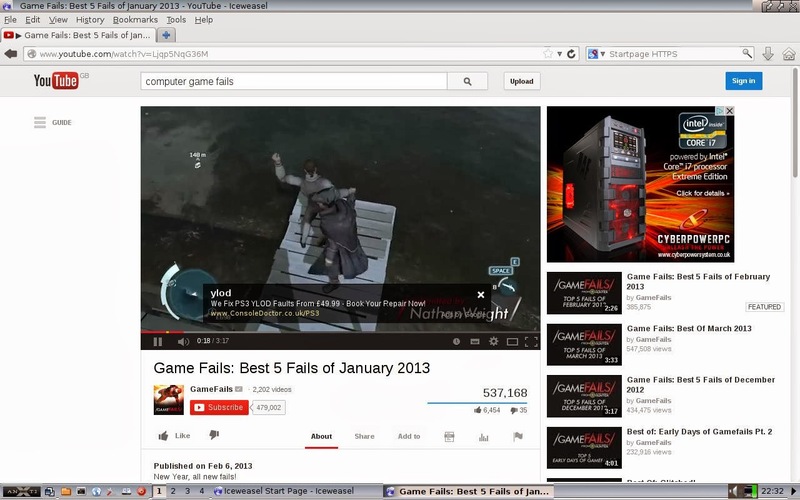 The GTK Youtube viewer lets you watch youtube videos through a standard desktop application. There is a good search facility on the right side of the screen. When you have found what you are looking for the video loads into a new window. My favourite application was Streamtuner. I have come across Streamtuner on a number of occasions and it is a great tool for finding and listening to online radio stations. Once you have found the station you want to listen to you can play the stream through the specified audio player or you can rip the streams to disk. 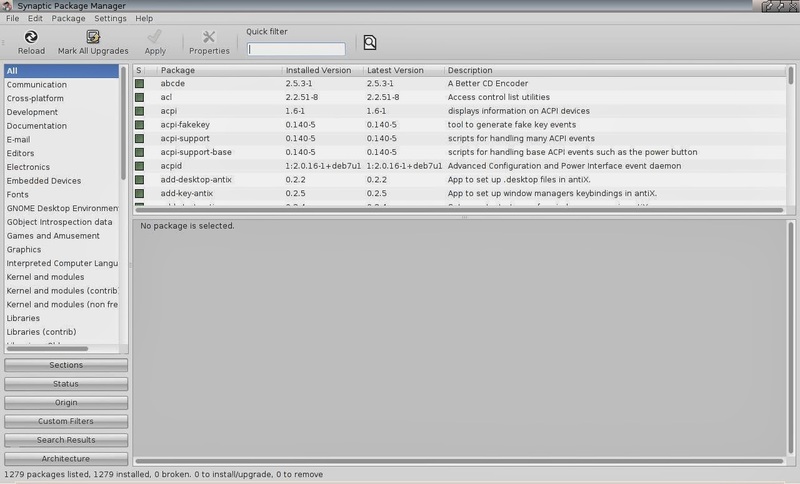 Synaptic is provided as the default graphical package manager for antiX. Whilst Mint fans will quite rightly speak about how good the Mint Software Manager is, I don’t think there is a better tool out there than Synaptic. Simply type the name of the application or a keyword to describe the application in the filter and a list of potential candidates appear. Right click and mark the application to be installed and you will be notified of all the required dependencies. Click “Apply” to install the software. There isn’t really anything to put here other than the fact that Flash is installed and so are the necessary codecs for playing MP3 audio files. Hardly anything came up during my testing of antiX. 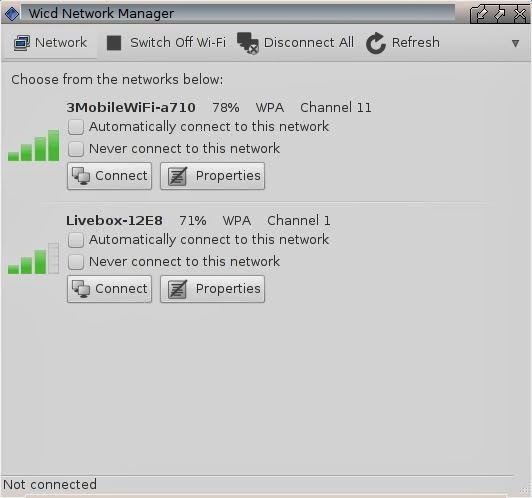 I have already mentioned the wiCD tool not picking up the wireless networks until I edited the preferences screen. In addition to this the audio mixer was set quite low by default but this was easily remedied. Finally in Streamtuner when I clicked play the audio streams didn’t play. I checked the preferences for Streamtuner and the default audio application for Streamtuner was Audacious. Audacious isn’t installed by antiX. To remedy this I replaced Audacious in the settings with XMMS and then I was able to listen to the selected radio stations. antiX is a great operating system. I loved every minute whilst using it. antiX won’t be for everybody and probably isn’t going to be used by many people as their main operating system. If you have an older PC lying around with Windows XP (or even Windows 98) on it then replace it with antiX and you will make your computer more secure and perform better. (You will also have a browser that is more likely to display the web pages in the way they are supposed to be displayed). 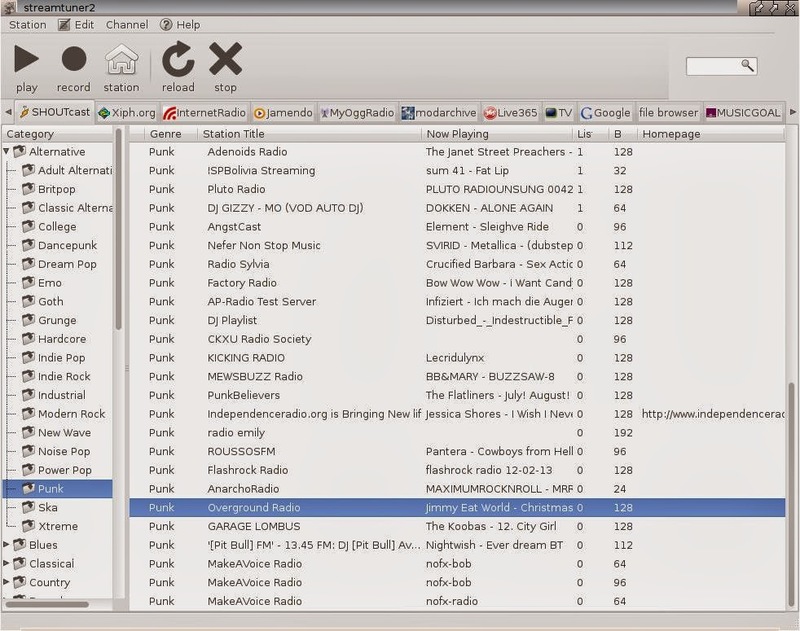 You can use antiX for recovering broken Windows systems, ripping music from online radio stations, as a jukebox or even as a web kiosk. If you spend most of your time online then antiX keeps out of the way to let you get on with browsing the web, using Facebook etc. antiX was easy to install, relatively easy to use and the performance was spectacularly good. Would an operating system with a political agenda put you off using it? I am using Antix in an old Thinkpad 600E/288Megabytes/10 GB and it works well. I do have a problem with the window managers that are not registering some ALT combinations. Yes, I did check for bindings to Meta, this laptop does not have Meta keys. But, everything else works fine and using fluxbox works like a charm. Antix leaves this computer with spare RAM, something that did not happen when I was using Fedora in it. "wiCD tool not picking up the wireless networks until I edited the preferences screen." WICD has always been that way and all hardware does not show as wlan0 every time. Sometimes it is eth1 or something other. Ifconfig -a command or inxi -F command will reveal this wireless interface for wicd preferences. That is why it is usually blank. Fitting on a cd like AntiX does requires very sharp skills for building a iso which Anti and the team handle with deft skills. I run 64bit bit AntiX full time. Baloney. There were never any "Nazi" bookmarks. The developer of this distro is a staunch anti-fascist. You are doing a great disservice to this fine man by posting such drivel. i'm nobody to this whole thing, just (as of this moment … who knows if i will tomorrow) have the same privilege you do to express my honest observation/opinion. disservice: that's their problem i'm afraid. they are the ones responsible for having released such … isn't it amazing that i'm being chided for what they did… how cute!? 🙂 such is life, no? hopefully by now they've gone and cleansed they're site and distro just to prove whistleblowers in the wrong… snowden and GOD only knows. Though I have not fully read through all of the bookmarks, I would like to say this. To read, review, and fully understand the topic; Then to develop an opinion; Is difficult. To segregate a word from it's context; Then to form an opinion; Is easy. Observing version 12 and the references to the Edelweißpiraten, it becomes not a question if nazi links exist, but what level of personal interest is triggered by the word nazi. A recent previous version of AntiX was dedicated to Marek Edelman, a hero of the Warsaw ghetto revolt in 1943. Hardly seems likely that the author who saluted this great Jewish hero is a Nazi supporter. An alternative which is mis missing in your list is CrunchBang! I used crunchbang for a few months, but the learning curve can be steep. I was looking for functionality without too much headaches. I ran across antiX and have been using it since. Most of its setup are intuitive, like the control center, but once you get it setup the way you want it, the time spent is worth your while. I use a junkbox system I made from old parts of several computers. PIII 996 Mhz with 512 Mb memory, 40 Gb hard drive, wireless, usb drives, and an old CRT monitor. It loads and acts faster than my AMD FX-4140 or i5-750, even if it ain't. I loved the concept of AntiX (light yet full-featured; uses my fave WM, ICEWm), and I used v11 for some time. I found it had some challenges, especially with non-root users accessing USB devices. Have not used it for a few years, so maybe the newer, 64-bit editions are a little smoother. I found the distro's heavy political flavor to be a bit much, but admit that it didn't affect the functionality or the helpfullness of those on the forum. 1. It is extremely flexible. 2. It is available in three forms under the "antiX" name: Core, Base, and Full. 3. It is a lightweight system, and it runs well on aging systems, and extremely fast on newer systems. Though the original antiX was developed primarily for older systems, a more recent variation, also developed by the author of antiX, known as "anticapitalista", anti, as he's often called, also has collaborated with the MEPIS Lovers community since the origination of antiX, and over the past year, he also developed another excellent distribution, MX-14, an Xfce desktop distribution that uses a few more of the MEPIS-based tools, and he developed it based on mutual interest and with considerable help and feedback from the MEPIS community. That same community has also been working on another KDE-based variation of MX-14 that some of the original MEPIS community is experimenting with. At this point, I've not seen an official build of this work. Instead, there are some instructions and tips for those who want to build a KDE version of MX-14 directly from the Xfce-based work. I have not personally verified or checked out that work, but in the past, I've built my own KDE and Xfce custom systems from either antiX Base or Full, and I have an existing Xfce-based system that I built from the ground up with antiX Core. I even wrote a now aged tutorial describing the steps I took in building that system, and a few people have used that tutorial to build their own similar systems. The ease in which that can be done by someone with a moderate amount of skill shows that while, on one hand, the antiX Core effort may not be the choice for a beginner, it doesn't take years of expertise to put together your own system because antiX provides so many excellent tools. The fact that the current MEPIS Lovers Community has also performed similar work adds evidence to the claim that it's reasonably straightforward to build a wide variety of very usable custom systems from any of the antiX tools found in each one of these excellent distributions. When saying CPU is running 100% I am referring to the meters autoloading on the desktop on both the user and when logging into root. antiX 15 and MX-15 are both available. I heartily recommend either of them. The MX-15 version is a lighter than average desktop that provides stability and a reasonable compromise between efficiency and features for those with aging systems who still want to use a desktop approach. The antiX 15 version takes advantage of the newest persistent state technology, allowing you to either run live or install, and when you run live, persistency allows you to access applications and settings that you've set in previous use of the software. antiX is running on my Compaq Presario Model 5000/8000 desktop; AMD Athlon XP 1800 (662 AMD XP/MP/4 Palomino); RAM 512Mb as of tonight. HDD is in bad shape and felt lucky to get the old 'puter running again.